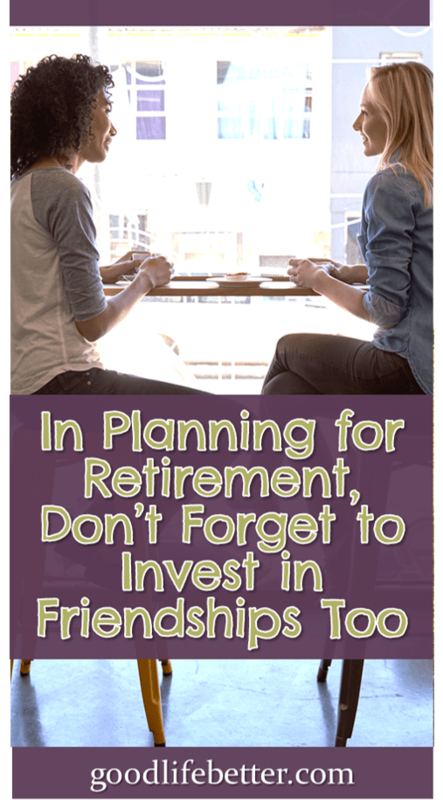 In Planning for Retirement, Don't Forget to Invest in Friendships Too | Good Life. Better. Retirement planning is usually about money, especially the big question of how much we need to have saved to maintain the lifestyle we want, all the way to the end. A second priority might be spending more time with a significant other, or living close to family. But what about friendships? As Blanche, Dorothy, Rose, and Sophia made clear, being happy in retirement isn’t just having enough money, or being able to attend your grandson’s soccer game. Your friends will be the people you travel with, or go shopping or to the movies with, or who you ask to drive you home after a colonoscopy, knowing they will resist asking embarrassing questions (or at least, laugh with you when they ask them). If you let your friends slip away without a fight, you may end up regretting it. Many years ago, I remember visiting my grandmother in the assisted living facility she had recently moved into, and asking her if she had made any friends. I assumed the answer would be yes because all the people there were old and therefore must have lots in common (it was not). Looking back now, I can see that it was a poorly thought-out question. Being around the same age doesn’t mean you are going to have a ton in common with someone. If that were the case, then high school would have been awesome and not awkward in the slightest (it was not). 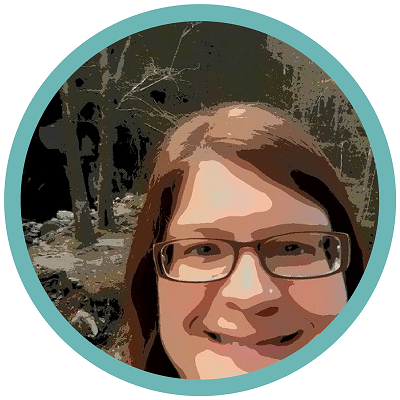 And it isn’t just about your likability (although, be honest with yourself on this one), or your ability to tolerate the foibles of others long enough to discover attributes that make you want to spend time with them. It’s about these two things plus your willingness to put yourself in situations where you can meet people with whom you share common interests and who are also looking to make new friends. Since I was 23, I have lived in three major cities and in each my ability to develop deep and lasting friendships was very different. In city #2, now back East and in my late 20s, I definitely found it easier to make friends but the friends I made were in very different stages of life than me. They were dating and getting married and having babies whereas I was single and had two cats. In city #3, which I moved to in my early 30s, the number and quality of the friendships I have developed continues to amaze me. A big part of this is me, and the increased confidence I have in the value I bring to the friendship. But it also comes down to being able to find people with whom I share interests and goals and who didn’t already have such a close circle of friends that they didn’t have the time to invest in forming new relationships. Friendships I Hope to Maintain: 10? 12? What If The Community I Retire to Is High School with Walkers? You may be thinking that I am being a bit premature in worrying about who is going to drive me home from my colonoscopy in 20 years and you may be right. I have always been a planner. But I have been in situations where I haven’t had a lot of good friends and I have been in situations where I have and I will take the latter any day. 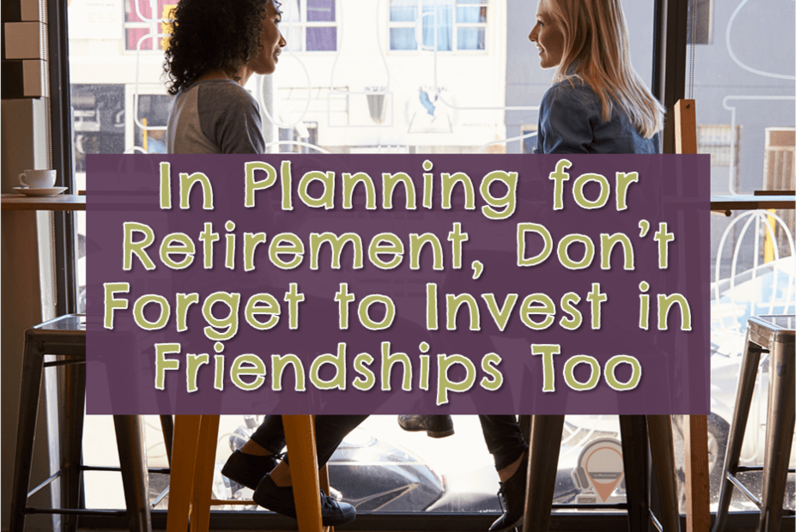 If I don’t plan to remain connected to my current friends, I don’t think my retirement will be as rich and as satisfying as it could be. But My Spouse and Kids Will Be There For Me! I don’t know how to make this point diplomatically so I am just going to say it: if your significant other is a man, and you are not, chances are you will outlive him. By several year. And your kids and/or nieces and nephews? Well, think about how much time you have right now to devote to the generation above you. Can you spend as much time with them as you know they would like? Probably not. So that brings us back to friends. One of the phrases we tell kids when they are struggling to make friends is “you have to be a friend to make a friend” and that is still applicable even as adults. Stay in touch. This is an obvious one but one I think trips us up most often. Maybe you think that you can’t reach out unless you can sit down and write them a long email updating them on your life, or that you need to find the email they last sent you and re-read it and respond to it. Guess what? You don’t have to do any of that. You can let them know you are thinking of them with a short post on their Facebook page, or with an email or text. Today doesn’t have to be the day you re-establish that super deep connection you had years before. Today is the day you prevent that bridge from burning so one day in the future when you do have time, that friendship still exists. Actually be interested in their lives. When you do reach out, don’t just talk about yourself but ask them how they are doing and respond to what they tell you. If you can’t remember the particulars, that’s okay. They will be touched if you remember even some of their story. Let them help you. Most people like to be needed. 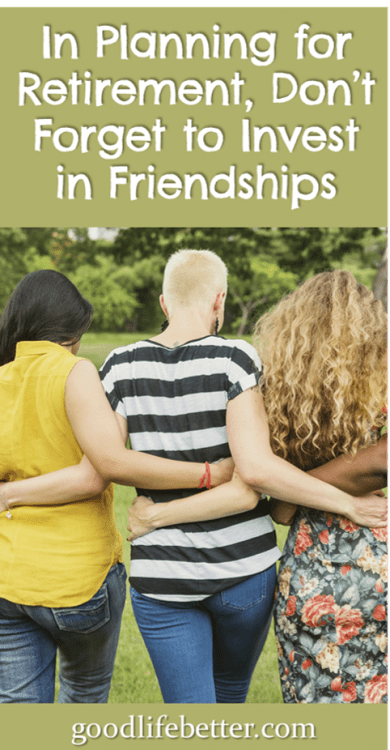 If you are super independent like me then this one might be a little hard but it is a great way to re-establish a connection and remind the person why you became friends in the first place. Plan visits every few years. Nothing beats face-to-face when it comes to keeping friendships alive. The good news is that it doesn’t have to be very often to be effective. I have a friend I met in England more than 20 years ago that I still consider one of my closest friends and, while in recent years we have seen each other about once every 12 months, in years prior we would go four years or longer between visits. Those visits reminded us of the joy we find in each other’s company and allowed us to sustain the friendship until the next opportunity to see each other arose. Who Will Be Your Golden Girls in Your Golden Years? I already have a list of people I am going to do my best to maintain friendships with, and am looking forward to the time when we get to hang out without having to worry about our 9-5s. Do you? Let me know in the comment section below.